Returns projected using default budgets in the Corn-Soybeans Rotation Tool indicate that corn-soybean rotations have higher projected returns than continuous corn, given that commodity prices are at current harvest-time bids. 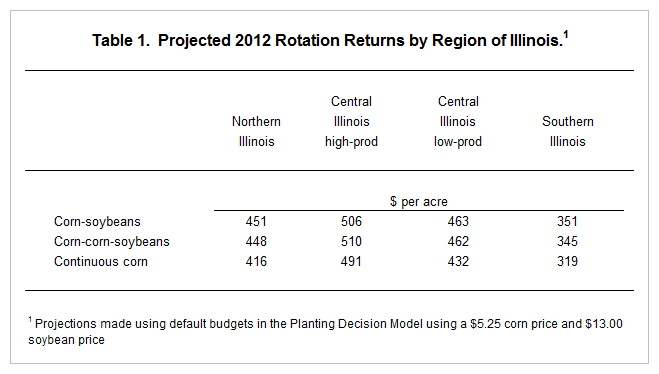 These projected returns do not suggest shifts in acres from soybeans to corn in Illinois. In this article, the Corn-Soybean Rotation Tool used to make these projections is described. Then, commentary on 2012 planting decisions is given. Evaluate corn, soybean, and wheat rotations. This tool is useful for farms with wheat in their rotations, such as farms in southern Illinois. Estimates yields and returns by planting date. If planting is delayed, this information is useful for determining whether to switch from corn to soybeans. Estimates returns from taking prevented planting payments from crop insurance. When planting is delayed beyond final planting dates contained in crop insurance policies, this tool estimates returns from taking prevented planting or from planting a crop, thereby providing an return estimates when make prevented planting decisions. Estimates returns from replanting corn. If an uneven stand of corn has emerged after planting, this tool will estimate returns from replanting the damaged stand or keeping the damaged stand till harvest. The layout of the Corn-Soybean Rotation Tool is shown in Figure 1. The tool contains corn-after-soybeans, corn-after-corn, soybeans-after-corn, and soybeans-after-two-years-corn budgets. Each budget contains defaults for yields, prices, and non-land costs. Users can modify these items. Also, default budgets are available for northern Illinois, central Illinois for farms with high-productivity farmland, central Illinois for farms with low-productivity farmland, and southern Illinois. 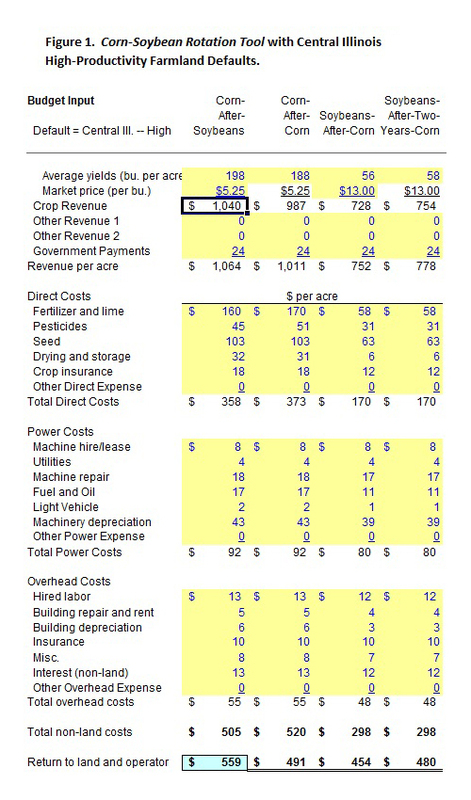 Any time there is an Internet connection, these budgets can be updated with current values from the farmdoc website. $480 per acre for soybeans-after-two-years-corn. Continuous corn which has a return of $491 per acre. Note that there is only a $4 per acre difference in returns from the corn-soybeans and corn-corn-soybeans rotations: $506 for corn-soybeans versus $510 for corn-corn-soybeans. Both rotations have higher returns than continuous corn. For high-productivity farmland in central Illinois, corn is projected to be more profitable than soybeans. However, planting all corn in 2012 could lead to lower returns in future years, as corn-after-corn has lower returns than rotations. More discussion of long-run rotation considerations is given here. Given these long-run considerations, it does not seem likely that central Illinois farmers will shift acres from soybeans to corn, particularly given substantial reductions in corn-after-corn yields relative to corn-after-soybeans yields that many farms experienced in recent years. Central Illinois high-productivity farmland usually has returns that are more favorable to corn than other areas of the state. Table 1 shows rotation returns for northern Illinois, central Illinois with low productivities farmland, and southern Illinois. In all cases rotations have higher returns than continuous corn. The Corn-Soybean Rotation Tool is used to make projections of 2012 crop returns. Projected returns suggest that rotations are more profitable than continuous corn, suggesting that there will not be a shift in acres to corn in Illinois.